It’s time to gear up for great journeys on the Pacific Crest Trail. But it’s important to remember that it’s our responsibility to the keep drinking water safe and the stunning scenery smelling sweet. We all need to use the very best Leave No Trace practices while doing our daily deed along the trail. While training wilderness rangers, we normalize talking about pooping in the woods so they are ready for straight-faced encounters with hikers. I encourage everyone to speak openly and candidly about daily dumps with fellow hikers along the trail. There’s really no room for embarrassment about pooping day after day on the trail. And there’s even less room for leaving unburied waste for someone else to see, smell, or step in. Unfortunately, with more hikers hitting the trail, there is a growing epidemic of poorly buried or unburied human waste and toilet paper. Photo by Skyler Ogden. I estimate that last year, long-distance and other PCT hikers relieved themselves more than 300,000 times, all within a narrow corridor. In many areas, decomposition is exceedingly slow. This year is shaping up to be an even bigger year for hikers and their poop on the PCT. So let’s all make bombproof plans to keep our feces together each and every day we are out there. Where & when to go? If you don’t have it down yet, please commit to memory: “200 feet, 7 inches deep”. That’s the minimum distance from camp, trails, and water, plus the depth to bury stools. It will take most people about 80 steps to walk 200 feet, but I encourage everyone to find your very own special place even further away to prevent feces concentration near popular campsites. Campsites usually are near drinking water sources. This also will help you avoid finding someone else’s poop by accident. If you can, wait until you are well down the trail, a mile or more from camp, before heading off trail to dig your “cat hole.” For those who routinely have to go urgently first thing in the morning, why not take a leisurely walk the evening before to find good digging and get the hole ready for tomorrow? Being in a rush is unlikely to yield a hole deep enough, leading to poorly buried waste, and animals digging up your mess. Trade tips with trail friends about where to find the easiest digging in each new section of the PCT. Some people look to the uphill side of big tree. I like tree wells at the roots of a fallen tree. Please, please carry a real digging implement. There are many lightweight trowels on the market, although plastic trowels rarely hold up for a long hike. Sticks, boot heels, hiking poles and rocks just don’t cut it for digging 7-inch-deep holes, day after day in all kinds of ground, much of which is very tough. 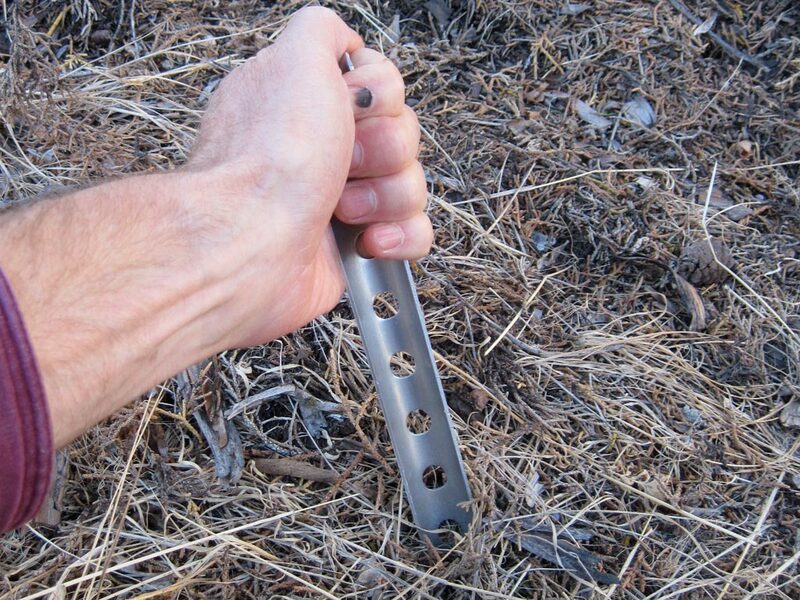 If weight or cost discourage you from buying a quality metal trowel, I suggest a tent stake designed for snow camping. It weighs just one ounce and doubles as a tent stake. Mine has worked for years and is the 9 1/2” model from SMC; it’s available from many sources for under $2. Make a mark 7-inches up the stake to insure an adequate hole. Please, please, please do not simply roll over a rock, smashing the poo. That will totally stop decomposition. However, it does not stop yucky smells and sights. PCTA trail workers, who bust their butts to keep the trail in good shape, will curse you for eternity when they find the perfect rock to improve the trail and discover your precious gift. Friends don’t let friends roll over rocks for any reason, except trail work. Outward Bound and NOLS, the two foremost organizations introducing people to wilderness skills, train their students to use natural materials instead of toilet paper. Possibilities include bark, cones and smooth rocks. Just don’t trash living plants. Search “alternatives to toilet paper backpacking” for a big load of great suggestions. Here are some. If you have to use toilet paper, it must be carried out. Buried paper slows decomposition, which is already super slow, due to long winters and cold summer nights. Don’t burn paper in the hole, as way too many forest fires have been started and way too many PCT hiker plans have been severely disrupted by wildfires. And never put “handy wipes” in the hole – they’ll be there forever! If you insist on putting TP in a cat hole, use as little as possible and wet it down with urine or water, which will help decomposition. AND: Women will need to carry out all feminine hygiene products, since they won’t ever decompose. If your group is larger than six people and is planning to stay in the same camp for more than one night, take special precautions to avoid contributing to the unburied poop epidemic. Please carry a real shovel and ask a knowledgeable party member to find a secluded place with good soil to dig a “slip trench” for everyone to share. Basically, it is a 6- 10-foot-long, trench, 10 inches deep. After a person takes their dump at one end, they cover it so the trench is ready for the next deposit. Introduce the trench to everyone together to make sure they all understand the drill. Hang a plastic bag large enough for everyone’s toilet paper. Place the shovel in a prominent location to be carried to the trench, thus indicating that it is occupied. And don’t forget hand washing. Without such a group poop arrangement it is way common for a few folks – especially the inexperienced – not to know the drill about burying poop. Even if everyone digs cat holes, with so many people over a few days, it is too easy to dig up one another’s poop by accident. Finally, take the Super Dooper Pooper Challenge! 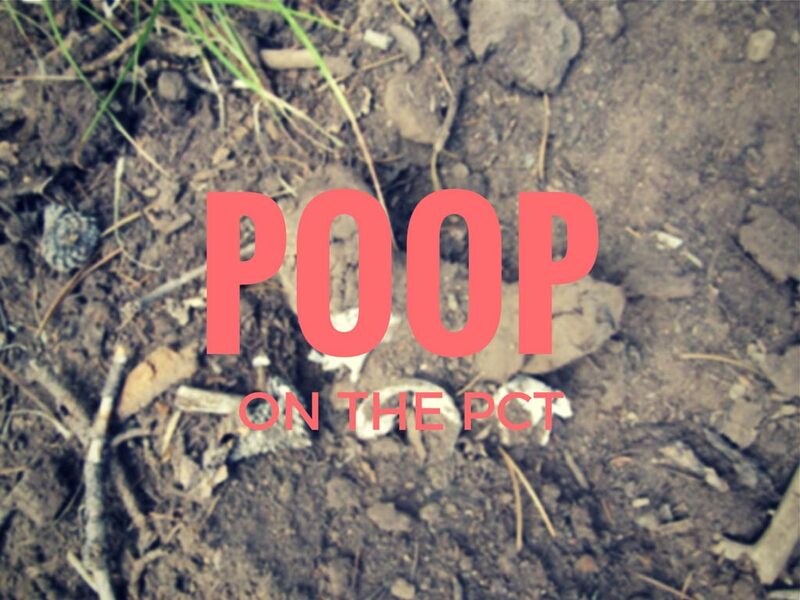 Only YOU can help stop the unburied poop pandemic! Here’s the super dooper pooper recipe: Go the extra distance, at least 500 feet. Dig 7 inches deep, pee in the hole, drop your deuce, skip the TP, stir in the poo with some dark organic dirt if it’s available, then bury well. And, spread the technique to others. You’ll sleep better knowing you left the least trace possible. Forest Service Wilderness Ranger and Trails Specialist John Schubert has been working in Oregon since 1989. 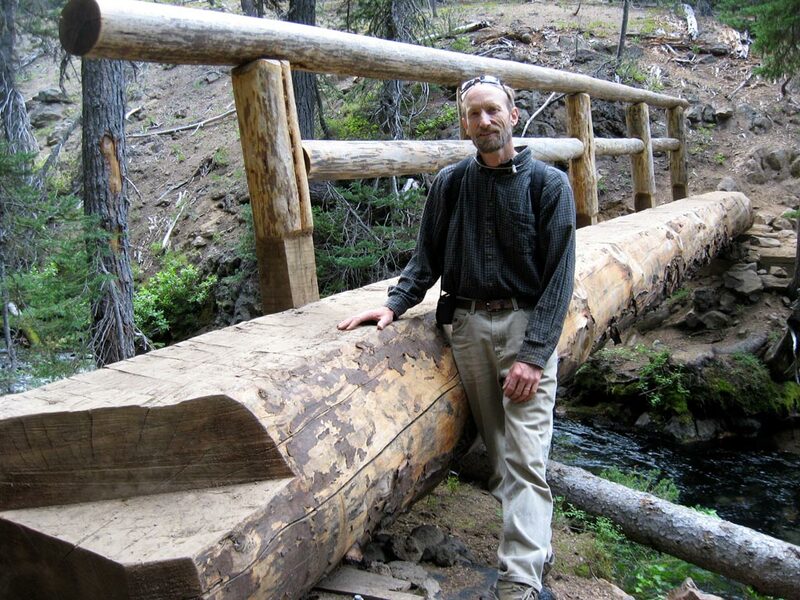 His many tasks include enhancing the Pacific Crest Trail as it passes through the Deschutes and Willamette national forests. He helped initiate the PCTA Trail Skills College and authored the curriculum. John also helps train trail crew leaders and Americorps trail crew members for the Student Conservation Association. He started his career with the SCA in the 1970s doing trail work and restoration and as a ranger in the North Cascades and Teton national parks and King Range National Conservation Area.